The original Wild Oats was the comic masterwork of one of the 18th century's most prolific actor-playwrights, John O'Keefe (1747-1833). This colorful Irishman wrote some 70 plays between 1774 and 1800, and though he lost his eyesight in 1798, he continued to write for the stage. His published memoirs are a gold mine of anecdotes about the theatre folk of his day. In 1791 O'Keefe decided, with his sure sense of comedy, to produce Wild Oats. With this story of Jack Rover, the great-hearted, Bard-quoting strolling player and his bewildering adventures in search of love, fortune, and family, O'Keefe found his greatest hit. He employed many of the traditional tricks of the English stage, such as the "aside" to the audience and the multiple mistaken-identity plot, and he peopled his play with a gallery of comedic "types" still recognizable today. Within a few years of its London premiere Wild Oats had been performed wherever the English language was spoken. It remained in the standard repertory of touring companies on both sides of the Atlantic until the last decade of the 19th century, and then lap sed into obscurity. Wild Oats was rescued from oblivion in 1976 when Ronald Bryden, literary editor of the famous Royal Shakespeare Company, brought the script to the attention of director Clifford Williams. The RSC production was a surprise runaway hit in the 1976 season, with Alan Howard as Rover, Jeremy Irons as Harry, and a young Ben Cross (Chariots of Fire) as one of the ruffians. Highly acclaimed productions followed in New York and at Washington D.C.'s Folger Shakespeare Theatre (where John Neville-Andrews played Rover), and theatre managements and writers around the country were alerted to the durability of O'Keefe's merry mischief. One of those alerted was the American playwright James McLure, author of Laundry and Bourbon and Lone Star, a dramatist deeply interested in the myth of the American cowboy and an admirer of the" ham-actor" strolling theatre companies that brought culture to the cow towns and mining camps of the Old West. 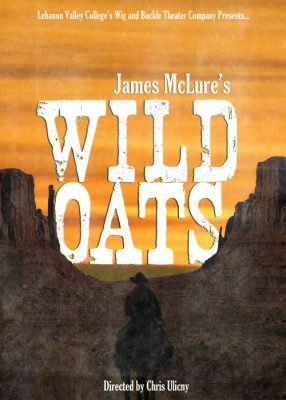 For California's L.A. Center Theatre Group, McLure adapted the English characters and locales of the original to fit the rootin' tootin' shootin' Western climate he loved, and on 16 June 1984 the "Americanized" Wild Oats opened to a delighted public at the Mark Taper Forum in Los Angeles. The adaptation has since entertained audiences throughout the U.S.; in McLure's words, "It is an affectionate tribute to the men and women of the late 19th century who toured the American West as traveling players." With this production of McLure's adaptation of O'Keefe's Wild Oats, director Chris Ulicny's intrepid band of actors, technicians, and production staff kick off the 76th season of the Wig & Buckle Theater Company's life at Lebanon Valley College, a season the company has titled "Theatricality!" Wild Oats belongs to a genre of dramatic literature called metatheatre, plays which take as their themes the nature of dramatic art itself and comment on the process of theatrical performance. 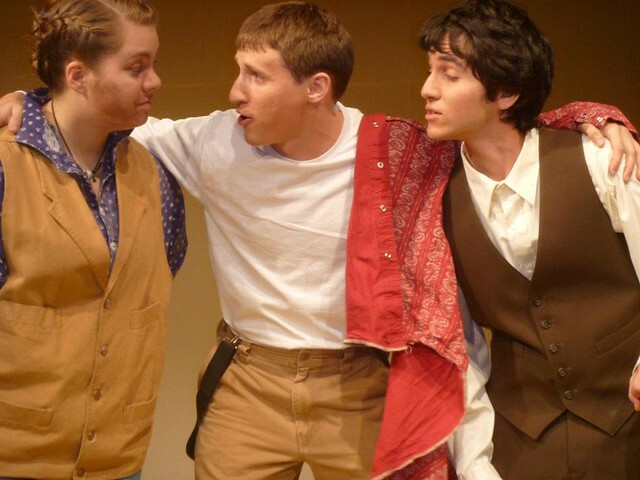 To bring these concepts to life, this cast and crew (half of whom are making their first appearances on the Leedy stage) have had to blend a complex mix of old-fashioned acting styles and present-day comedic tricks into a school of performance techniques known as "theatricalism," the point of which is not to make the audience believe that what they're seeing is "real;" instead these techniques—the "aside" and other types of direct address to the audience which break what show-folk call "the fourth wall," the live incidental musical accompaniment of (and ironic comment on) the play's action, the entrance and exit of actors through the audience, the cartoon violence in which no one is really hurt (over 50 rounds of blank ammunition are expended in each night's performance,) the extravagantly tangled explanations of the show's plots of mistaken identity and long-lost children—constantly remind us that what we're viewing is a performance. In absorbing all this, the student performers and production staff of Wild Oats have taken part in a complex synthesis of interdisciplinary collaborative learning which is in the best tradition of LVC's mission of liberal arts education. I am honored to be able to work with such dedicated young men and women on a daily basis, and we hope you will be entertained by the end result of all their devoted efforts to achieve the live theater's most ancient goals—to delight and instruct you, our patrons. As Hamlet says, "the play's the thing!" Enjoy the show!